IMG_5705.JPG, originally uploaded by lisabagg. We have literally about 20 kids and 10 adults coming over this afternoon for some pre trick-or-treat festivities. 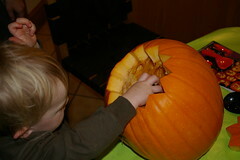 In other words, trying to fill up the kids with some good food before setting them free on the candy. And giving the adults some beer (for medicinal purposes only) to help weather the madness. It should be tons of fun. 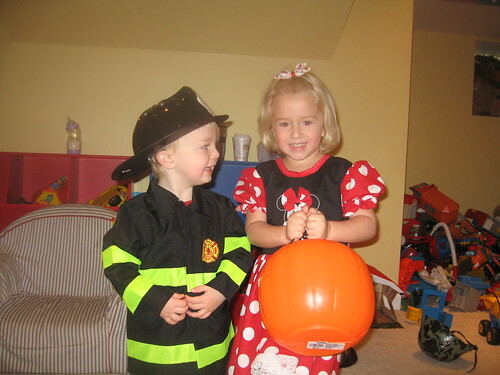 Here is Firemaster Finn along with Minnie Mouse (as portrayed by Emma Jones) this morning at daycare. And note how he can't keep his eyes off her. He loves the ladies! baby Burns, originally uploaded by lisabagg. Congratulations to Chris and Becky on the arrival of their beautiful baby girl, Caitlin! We met Chris and Becky when we moved here. Chris is a friend of Shawn's from work, and Becky is his lovely doctor wife. We look forward to playdates with Baby Burns! 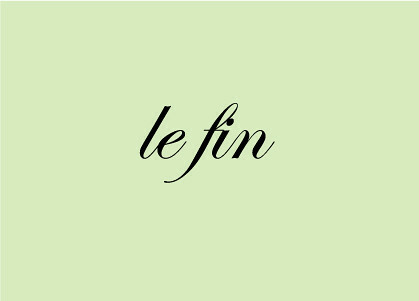 le Finn, originally uploaded by lisabagg. So, today, Finn and I were watching old Tom & Jerry cartoons while he's drinks his morning milk. And when it comes to the end of the cartoon, the words "the end" flash across the screen. And then Finn says, "Look, Mommy! The ... end." He totally read the words! He's a baby genius! Really, I'm astonished, and I couldn't be more proud. Many of his books conclude with the words "the end". He usually chimes in at the end of his stories and points to the words when we get to them. But this was totally out of context. I have to say that it is extraordinary watching this little one grow and learn. And it's not egregious bragging if I'm just posting these milestones on a site that people elect to visit, right? Right?!? IMG_5627.JPG, originally uploaded by lisabagg. Here are some Spiderman Jammies that I got secondhand. Finn absolutely loves his "spider pants." So much that I had to bribe him with sweets to change out of the pants before daycare and compromise on letting him wear the shirt all day at daycare. I found myself rationalizing with him that even Spiderman needs to get washed sometimes. IMG_5633.JPG, originally uploaded by lisabagg. Since Delilah is no longer the baby of the family, she's had some major adjustments to make. 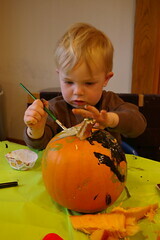 Finn and I decided to take her mind off things Friday with a trip to the children's museum. Lilah could not believe that she was allowed to leave the house without her parents or sisters and go play with Finnie. I half expected these two to shout "Spring Breeeeeaaaakkkk! ", they seemed so happy and free. 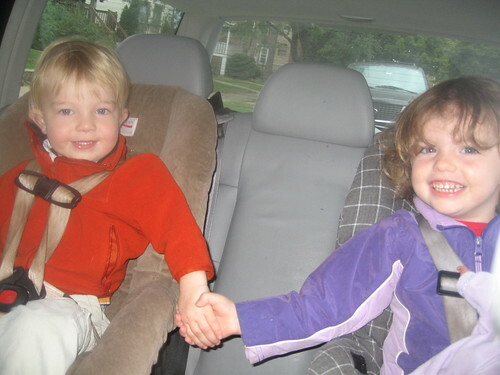 They held hands in the car, sang songs, and had a blast at the museum together. At lunch, they ate together and even shared their M&Ms with one other. They enjoyed each other so much that it was serious meltdown time when it was time to go home. Finn started to cry and said, "I want Lilah! I love you, Lilah!" And Delilah was saying, "I stay with Finnie! No go home! Noooo!" But like Romeo and Juliet in miniature, I had to pry them apart and they were cruelly left to contemplate their solitude during naptime. But I'll scoop up that Lilah for a playdate any chance I get. IMG_5630.JPG, originally uploaded by lisabagg. 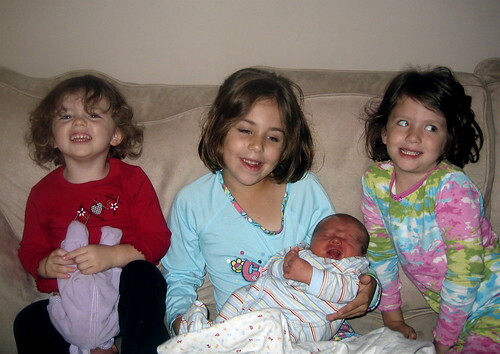 Here are the proud mommies big sisters with their new baby brother! IMG_5597.JPG, originally uploaded by lisabagg. 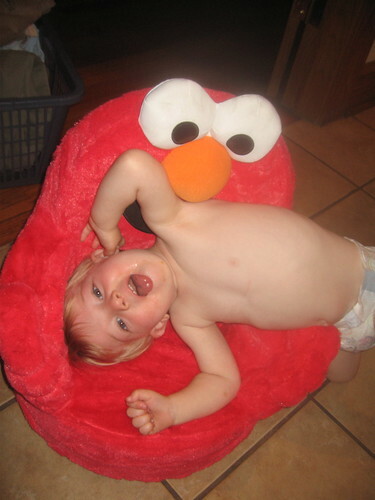 Here's Finn goofing around in his new Elmo chair (thank you, Uncle Alex and Auntie Smears!). Despite the fact that it looks like Elmo is just waiting for the right opportunity to devour his delicious pristine toddler flesh, Finn totally loves and trusts the mighty Elmo chair. Not to be confused with his naughty "time out" chair, the Elmo chair is the preferred place to view episodes of Thomas, eat peanut butter sandwiches, and make pretend phone calls. "Hello, Daddy? You at work? ... OK. .... OK. ... Uh huh. ... Now come home." We ran into Finnie's little girlfriend, Ella, at a Halloween party at the local park. Despite the fact that it was the most sweltering Halloween celebration in recent memory, these two lovebirds had a great time at the petting zoo, pumpkin patch, and even took their first pony ride. It's worth noting that both of them were too scared to approach the ponies alone, but were definitely in it together and loved it so much Ella's mom, Katie, and I had to pry our respective little ones off the ponies. Here's Finn going in for a smooch. Another busy month for the staff here at LHD&E. The first thing I did was a new site design for Alert Chicago, a site for residents of Chicago that helps them get ready, respond, and recover from local emergencies. The challenge with this site design is that there was so much information that needed to be represented, including different dynamic news feeds. I incorporated different photos from the city on a seven-column grid to give the site enough space to breathe, while being navigable. Next, I did a design for Dr. Lauren Streicher's personal site. 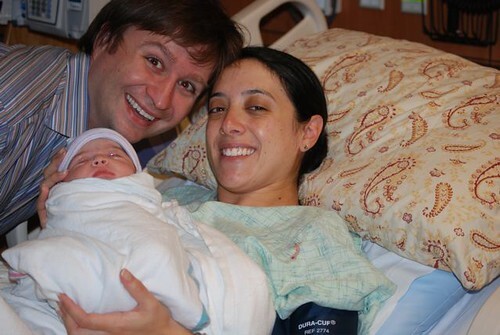 Dr. Streicher is perhaps one of the best-known OB-GYNs in the country with an absolutely amazing career. As well as her practice, she is a book author, XM Satellite Radio host, Chicago Sun-Times columnist, host of iVillage's In The Loop, and frequent contributor to Good Morning America and Chicago's CBS affiliate. She's also wonderful in that she takes otherwise taboo/scary topics regarding women's health and invites discussion. It was truly inspiring to work with her. I built a site for Ridgeline Capital Partners. The site is currently staged on my site, but is launching soon. The beautiful design was done by Amanda Hellman of Blue Print Design Group. Lastly, I wrote an article on design for the book industry for HOW magazine. Obviously, a topic I know a lot about. I got to talk to some really interesting designers from Picador, HarperCollins, Quirk, and (of course) Chronicle. Read it here. But this is what you get when you abandon your boys for FOUR DAYS! 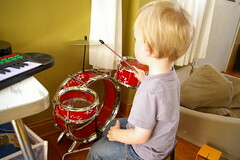 Finn saw this drum set in the store and gave one of the most enthusiastic woooah-ho-ho-HOOO's I'd heard yet. And who am I to deny him? 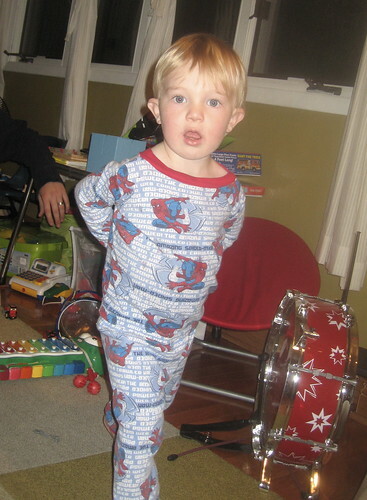 Actually, the truth is, I've been scheming to get him a drum set since he was in the womb. Mommy's absence provided the perfect chance!